At 16, I was working part-time at a hair salon and driving. I had to pay for my own gas, car repairs and even car insurance. Yep, we didn't get off easy in my family. And I had full coverage insurance on my cutie little two door hatchback. So of course, if I wanted to have a little fun with my paycheck at Target, that was on me. I knew what bills I had to pay. It was such a treat for me to go shopping (on payday of course) and pick up a few things from the beauty section (clearly this addiction, as some may call it, started early). I still love going to Target (or Ulta) and browsing the beauty section. Even though I have worked for a prestige beauty brand, I love drugstore products too. I'm going to break down my favorite go-to products that I always come back to. I swear by Neutrogena's Grapefruit Face Scrub. I first bought it over 8 years ago. I remember using it in my shower at my first apartment, I just love the smell! For me, I have oily skin, and if I don't use face wash with salicylic acid, I'll break out. This keeps my skin clear and healthy looking. Everyone keeps talking about the Voluminous Mascara by L'Oreal and for good reason. It's one I always recommend to people if they want a great mascara at a good price. When beauty sponges first came out, I was a little unsure of them. I don't like gimmicky products. I admit, I also had no clue how to use them. But after playing around a bit, I found them very useful. I do like the Beauty Blender brand (sold at Sehpora, click this link for more details on a previous post) but the Real Techniques Miracle Complexion Sponge Set is supposed to be the next best thing. I agree with this. I use one of these sponges everyday to apply my concealer. It prevents the concealer from creasing. Then I apply a powder to set the concealer. At this point I think we can agree that dry shampoo is a necessity. I can't (at least choose not to) live without it. My cousin recommended this brand to me after I had been using the TRESemmé Dry Shampoo. I still like having my TRESemmé around, but I really do like Not Your Mother's Dry Shampoo, the unscented version (found at Ulta). It doesn't build up like other brands and keeps my hair manageable. If you have not tried micellar water yet, you need to! There have been many nights where I am just too tired to do my whole nightly skincare routine. But I have to at least take my makeup off. 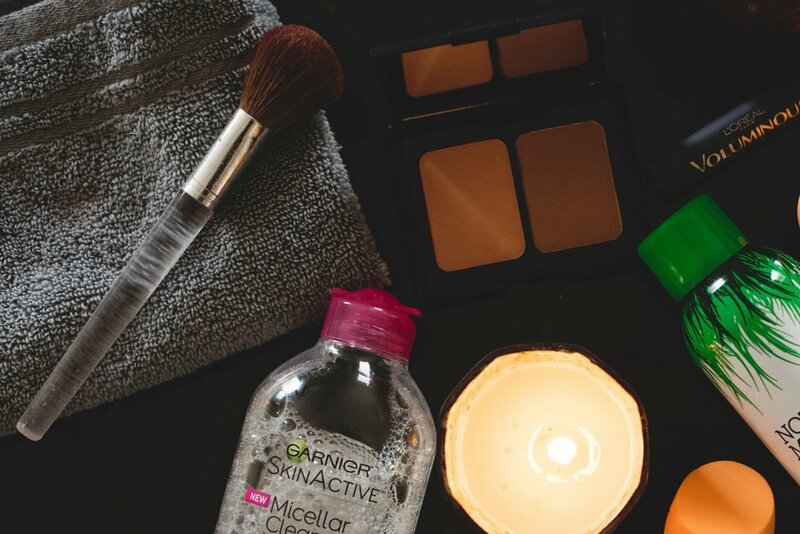 The Garnier Micellar Cleansing Water makes it super easy to do that. The water clings to dirt and oil so it's like cleansing your face without the hassle of actually cleansing. A few quick swipes and I'm in bed. Last but not least, let's talk cheek color. I bought the e.l.f. Contour Blush & Bronzing Powder ages ago. Bronzer in my opinion always looks great as a contour color. I apply some blush to the apples of my cheeks and then bronzer right under my cheek bone and bring it all the way back to my ear. And by the way, it's 4 bucks people! I did notice on Ulta's website that this duo is only available online, but if you go to Target, you'll find it in store. I did link all these products to Ulta's website. You can find everything here at Target as well (except for the dry shampoo, I'm not sure if Target carries it).